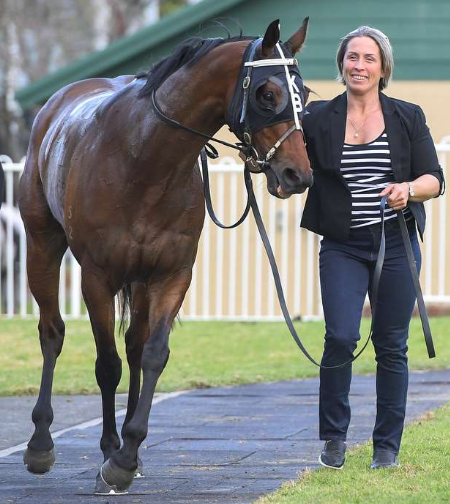 Fresh off a dominant win by Ednablue at Muswellbrook on Monday, Wyong trainer Kristen Buchanan heads to Port Macquarie this Friday with three live chances to continue her strong start to the racing season. Buchanan kicks off proceedings with her lightly-raced Star Witness gelding Hubble ($21 on TAB fixed odds) in the Watpac Construction CG&E Maiden Showcase Plate over 1200m. “He is second-up this Friday, and ran very well second-up last campaign,” Buchanan said. Kristen Buchanan [pictured left] then saddles up debutant Bid’N’Bare ($15) in the JR Richards & Sons F&M Maiden Showcase Plate over 1200m. The four-year-old Smart Missile mare is having her first start following some strong trials at Cessnock, Scone and Gosford. Perhaps Buchanan’s best chance on the card is Traumatised ($5) in the Winning Edge Presentations Class 2 Showcase Handicap over 1000m. The five-year-old Choisir gelding has drawn awkwardly in gate 10, but looks to be right in the race following some handy efforts last campaign. The racing action doesn’t end there for the Buchanan camp with runners also nominated for Port Macquarie Saturday and Tamworth Monday.